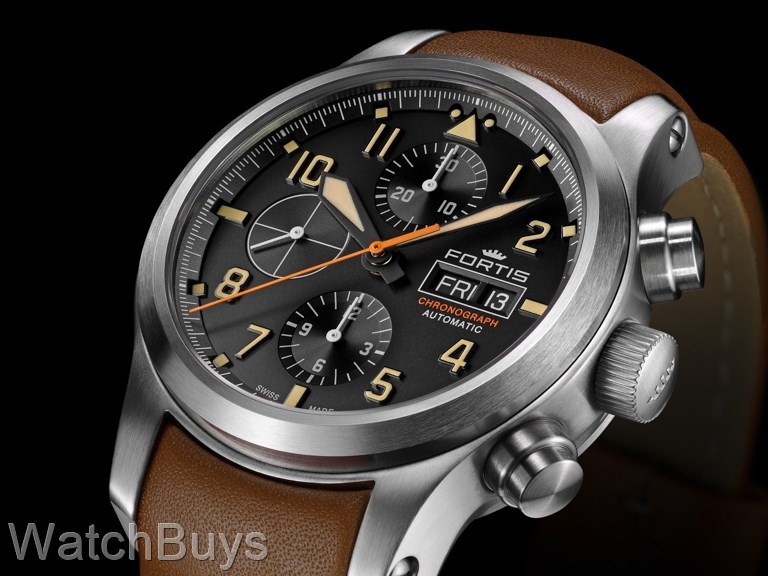 The Fortis Aviatis Aeromaster Chronograph has become one of our best selling Fortis chronograph watches, so we were very pleased to see at BaselWorld that the brand had added a new model with a twist. The new Fortis Aviatis Aeromaster Old Radium Chronograph uses a special color of SuperLuminova which closely matches the color of radium, a radioactive material that was used on watch dials and hands for many years before being banned as a health hazard (the SuperLuminova used on this watch has no radioactive properties). Adding this color to the dial and hands creates a very interesting watch - one that you might have trouble not staring at for long periods of time because the colors work so well together. This watch has a great bold steel case which definitely commands attention. And the integrated tan strap design creates a clean finish leaving no gaps between the strap and the case. But spend a bit more time looking at this watch and the standout feature emerges - the dial. The dial is made with an amazing attention to detail. The new Fortis Aviatis Aeromaster Old Radium Chronograph features a "chiseled dial". Fortis has employed special manufacturing techniques to create a multi-layer dial with engraved indices, retaining the classic design of earlier B-42 watches but adding a modern design. Take a close look at the picture on this page: you'll notice that Fortis has chiseled the hour markers from the bezel chapter ring. This is the first time we have seen this technique and we like what we see. Another commanding presence of this watch comes from a combination of size and legibility. The 42 mm satinized case makes the new Fortis Aviatis Aeromaster Old Radium Chronograph a perfect size for everyday wear. The Fortis Aviatis Aeromaster Old Radium Chronograph features a sapphire crystal with double anti-reflective coating for ease of use in a variety of lighting conditions. This watch features complete chronograph functions with sweep seconds at 9. This watch is fitted with a light brown calf leather strap with white stitching and Fortis tang buckle.